My Christmas present from Curtis arrived today via UPS. The green apple kitchen aid. I am not sure who really wanted this gadget--Curtis or me. But it is taken up a good part of my kitchen counter. Look forward to trying it out one of these days. Today Curtis and I celebrate 25 years of marriage. We celebrated back in June by going on an Alaskan cruise. Today it probably will be dinner and the new Sherlock Holmes movies. The pictues were taken in North Pole, Alaska--kind of fitting for this time of the year. Happy Anniversary, Curtis! Remembering Christmas 2009. We opened our presents on Christmas eve, after I got home from work a little early. Had a mish mash of food for dinner--tomato soup, lefse, shrimp cocktail, little smokies done like pigs in a blanket, got out the fondue pot and a cheese and cracker tray. Tim's brother, Ronnie had come up from SanDiego and he also spent Christmas eve with us. Lots of wonderful, big presents. A big screen TV for Curtis. A Kitchen Aid for me. A netbook for Cait. A new BBQ for Tim and Kirsten. And lots of goodies for the grandbabies. Here are a few photos to remember. 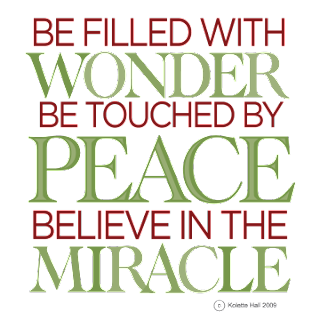 I hope everyone is enjoying their Christmas with family. We opened presents with family last evening and Harlee was beyond cute. Everything was "wow" or awesome. And every present "for me?" Nicholas was not one bit interested in presents until the little laptop for him came out that he could push buttons on--that one was a winner. I will be using a new green kitchen aide in the future. Yesterday Cait and I met Kirsten and Tim at the mall to take the kids to visit Santa. Nicholas was too busy trying to climb out of the stroller and just too busy. But Harlee was so excited to sit on Santa's lap. She was beaming from ear to ear. Didn't really say to much to him, but shook her head to all the questions he asked of her. This is what Christmas is all about!!!!! Now we have snow on top of all the ice on the ground and trees. Which makes it very pretty. 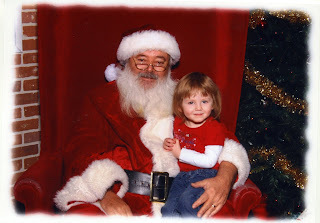 Met Kirsten and Tim at the mall, so we could take Harlee to see Santa. Her eyes were twinkling and she was very determined to sit on Santa's lap. She didn't say much to him. But shook her head when he asked her questions. Then Cait and I headed to Giant Springs to take some photos. Cait had a biff out, because there is ice under everything. She was just concerned I would end up on top of her, but I kept my 2 feet on the ground. Trying to finish up everything for Christmas. Not time for much baking this year. But the presents are all wrapped up and dinner for Christmas eve and day pretty much organized. I head back to work tomorrow and Christmas. It been a different couple of days here in central MT. We have had ice on everything. We had freezing rain the other night-which is almost unheard of here in Great Falls. And thick, thick fog. Therefore, all the trees are just beautiful frosted over. But it has been very dangerous on the roads and sidewalks. Thankful we had to go the Shelby on Sunday and not yesterday. And snow predicted the next couple of days, which should make life interesting. Stocked up on groceries for Christmas eve and Day. Taking Cait for a haircut later. The countdown is on. Headed to Shelby to pick up Caitlin from the train. It was EARLY. Due in at 11:38 and it was there when we arrived at 11:20. That is a first. Had Harlee with us after she spent the night at Nana's and Grandpa's. She was SO cute at Sesame Street Live yesterday. I am sure she would have been up on the stage with Elmo, if she could have gone. Harlee was very excited to see Auntie Cait and the big train, that was noisy. We are thrilled to have Caitlin home for the holidays. It's been a Whirlwind of a Week! Wow--next week at this time Christmas will be over and I am not even ready. Flying home to Canada for the last week has really put a dent in everything. But my mum is back home from the hospital--who know for how long?, but she is where she wants to be. And pain free too. Managed to get home late Thursday night, without my luggage, but it came yesterday. So, all is well. Got out just in time before the big storm on the east coast. Hope Lauree and her family are managing in the Washington, DC area. Today, Harlee and I are headed to see Sesame Street Live-When Elmo Grows Up. I think it will be right up her alley. And tomorrow we head to Shelby to pick up Auntie Cait on the big train. Somewhere in the next week I need to bake some Christmas goodies for us to enjoy. Wish me luck. Spent most of the day with Harlee and Nicholas yesterday, while Kirsten helped out a friend. It is proving to be an interesting Christmas season. Harlee thinks every wrapped gift under the tree is "for me". She also got into the little advent calendar I gave her and Nicholas and ate every chocolate in there. Nick seems to think unrolling the toilet paper over half the house is fun--one tries to make sure the door is closed. Trying to get cards done and a couple of gifts sent before I head home on Friday. It is impossible to do Wed. or Thurs. since I am working my 12 hour shifts. And we are in a major deep freeze. The weather bug says -20F out. Snow won't be melting for a bit. The Christmas decorations are going up little by little. The tree is up and decorated. Was frustrated for a bit when the middle section of the tree was without lights going on. And then I found the extra plug in and viola, it worked. Amazing!!! Harlee was in awe of everything when she visited today. Took her for a hairtrim and she sat like a statue and it was done in record time. Headed out back east again next week to help mum and Bill. My sister is there this week. Kirsten and the kids came over for dinner on Sunday and we had spaghetti. Nicholas enjoyed his meal, ending with a bowl of ice cream and Curtis captured the end results on my camera. He is such a ham. As soon as the camera comes out he is saying cheese.